I am excited to show you two pictures of one of my favorite perennials. Isn’t this a cool picture of a bee, ready to pollinate the flowers of this penstemon? I must confess that I did not take this photo (or the other one below). My husband took both of these beautiful pictures. This firecracker penstemon is happily growing in my garden and is now over 14 years old, which is rare. Every winter, it sends up spikes covered in red, tubular flowers, much to the delight of the resident hummingbirds. The blooms last through spring in my desert garden. In cooler climates, it will bloom in spring through early summer. To learn more about this red beauty and how easy it is to grow in your garden, click here. I hope you have enjoyed my favorite flower photos. Starting tomorrow, I will begin posting a series of my favorite DIY blog posts, so please come back for a visit! Have you ever taken out an area of grass and added plants in its place? I have – numerous times. My past was filled with grass – acres and acres of it, when I worked as a horticulturist for golf courses. Nothing made me happier then when areas of grass were being removed and I was able to design a new landscape area. It’s been 8 years since I worked as a staff horticulturist for golf courses, but the past few weeks have found me spending a lot of time back on the golf course. Earlier this week, I told you about my most recent project – creating landscape designs for up to 30 acres of former grass area. Two golf courses, that I have worked with in the past, are removing large areas of turf in favor of a more natural, desert-scape. The plants that I have chosen are extremely drought-tolerant, need very little maintenance and are native to the deserts of North America. Another important criteria for my choices of plants was that I have to had experience growing them myself, either in my own garden or professionally in landscape areas that I have managed. Desert Ruellia is a favorite shrub of mine. It is incredibly drought-tolerant. I like to use it as a smaller substitute for Texas sage. In this first landscape area, I wanted a shrub that could survive with intermittent deep-watering, limited maintenance while still looking attractive. The purple flowers that appear spring through fall will add color to the area. This flowering native, will find a place underneath the filtered shade of the large mesquite tree already present. Chuparosa explodes with color off an on throughout the year, attracting every hummingbird in the neighborhood. It does well in full sun or filtered shade. Succulents are a vital part of the plant palette for all of these new areas. Their unique colors and shapes add texture to the landscape and contrast well with the more softly-shaped plants. Desert spoon will be interspersed throughout this first area where its gray color will contrast with the darker greens of the shrubs. Santa-rita purple prickly pear is also high on my list of favorites. You just can’t beat the purple coloring that appears toward the tips of gray/blue pads. Often grown as a annual, Desert Marigold is a short-lived perennial that flowers throughout the year. Cold and lack of water don’t bother these tough little perennials. They require little to no maintenance – but I cut them back severely to 3 inches once a year to improve their appearance and promote more flowering, although you don’t have too. Whether you or not you are a fan of yellow – it is an important color to include in the garden because the color yellow helps the other colors in the landscape to ‘pop’ and stand out more vividly. Although short-lived, desert marigold self-seeds, ensuring that they remain a presence wherever they are planted. If you are a fan of penstemons, this is one to consider adding to your list. Firecracker penstemon has a long bloom period in the low-desert. It starts blooming in late December and continues into spring. You can often prolong the bloom period by removing spent flowering stalks, which will promote a second flush of bloom. I have several of these growing in my own garden – some are 15 years old and still going strong – although that is uncommon. I’ll be the first one to admit that this low-growing shrub is not exciting – one may even call it ‘boring’. But, bursage is seen carpeting the ground throughout the Arizona portion of the Sonoran desert. Its gray/green foliage serves as an understory plant that helps to tie the separate elements of this ‘natural landscape’ together. 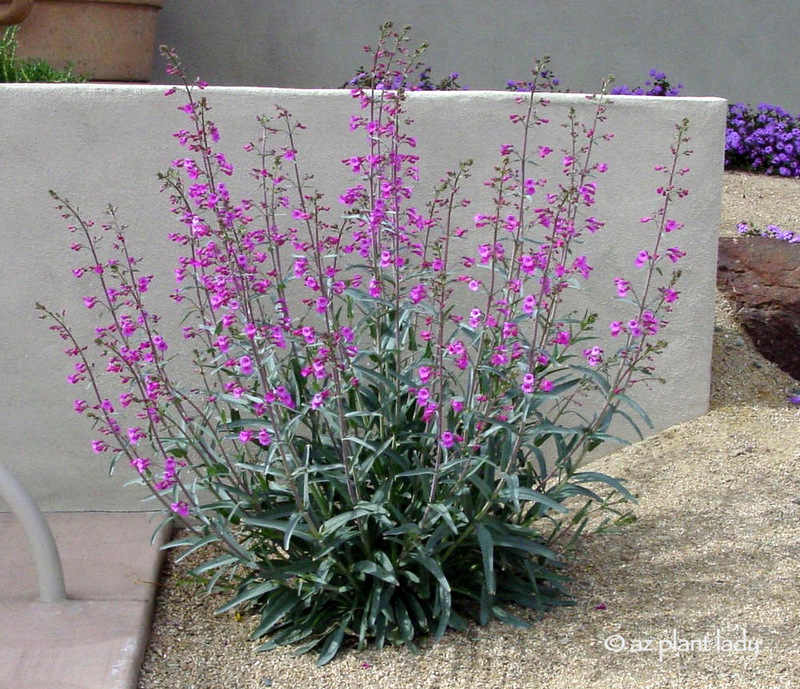 Example of bursage use in a natural desert landscape planting. The key to keeping bursage attractive is to prune it back severely to 6″ tall and wide every 2 – 3 years in early spring. So, this is the plant palette for the first of many ‘natural desert landscape areas’. I do have a few more plants that I will show you as I create designs for the other areas on the golf courses. Do you grow any of these plants in your garden? I am always on the lookout for beautiful landscapes that are well-designed and need minimal care. I like to call them sustainable or ‘fuss-free’ landscapes. A week ago, my friend and fellow-blogger, Pam Penick came into town on a quest to see examples of gardens that use little water. So, I was more then happy to spend a day with her looking at some great examples of gardens around the greater Phoenix area. The first part of our journey began with a visit to the beautifully-designed Arizona State Polytechnic Campus, which included cisterns, man-made arroyos and creative uses for urbanite. If you missed it, you can read about our visit, here. The second leg of our tour took us to a butterfly/hummingbird demonstration garden along a golf course and a well-designed parking lot (yes, I said a parking lot). First, was our visit to a butterfly/hummingbird demonstration garden. I must admit that I was excited about seeing this garden, which is near and dear to my heart because I designed it. In the beginning, this landscape area was rather unremarkable There were a number of foothill palo verdes, cascalote and ironwood trees in this area and a few over-pruned Valentine shrubs. The golf course community wanted to create a demonstration garden to show residents how they can have a beautiful landscape that will attract butterflies and hummingbirds that consists entirely of drought-tolerant plants. I want to showcase drought-tolerant shrubs and perennials that provided overlapping seasons of color. Firecracker Penstemon, Purple Trailing Lantana and Damianita. Paths were created by using stabilized DG that blended seamlessly with regular DG placed around the plants. While walking through the garden, we saw hummingbirds enjoying the flowers. The plants in this garden aren’t only drought-tolerant – they don’t require any supplemental fertilizer, soil amendments and need pruning once a year or less. It doesn’t get much better then that, does it? Our next stop was a park in the mountains of Scottsdale, called Cavalierre Park. I must admit that I was surprised that my favorite thing about the park was its parking lot. I realize that that may sound strange, BUT have you seen how ugly most parking lots are? The majority of parking lot islands are over-planted and over-pruned. In addition, trees seldom thrive in the small islands in the midst of hot, reflected heat. So, as we drove up to Cavalierre park, I was pleasantly surprised to see that there was no asphalt in sight. Believe it or not, these parking lot islands get no supplemental irrigation and need little, if any pruning. Each island was edged with rusted steel edging and filled with native rock from the site. The fact that there is not a traditional asphalt parking lot reduces the amount of runoff from rainfall. This non-traditional parking lot created from stabilized DG (decomposed granite) doesn’t heat up, thereby keeping the area a bit cooler since it doesn’t contribute to the ‘heat-island’ effect that asphalt does. During construction cacti and trees were salvaged from the site and replanted onsite once it was finished. Trees too large to be removed were incorporated into the design with steel edging preserving their original grade. This raised planter keeps the existing mesquite tree and saguaro cactus at their original grade while creating a beautiful, focal planting near the entrance of the park. I am constantly amazed at how beautiful sustainable landscapes can be simply by using good design and arid-adapted plants that are maintained correctly. I don’t know about you, but I would much rather enjoy a parking lot like this instead of one surrounded by asphalt and over-pruned shrubs, wouldn’t you? I hope you have enjoyed this second installment of our tour of sustainable landscapes in the Phoenix area. Do you have a front garden or a front yard? I really don’t like to refer to front area of a home as a ‘yard’. Now, while I do have a piece of ground adjoining my house – it is so much more then that. The piece of ground is filled with trees, shrubs, perennials and succulents, which in my opinion makes it not a ‘yard’ BUT a ‘garden’. So, I thought that I would show you a little of what is growing in my front ‘garden’…. This time of year, my firecracker penstemon (Penstemon eatonii) is in full bloom, much to the delight of bees and hummingbirds. This tough perennial blooms January through April in my zone 9a garden. In cooler climates, it will flower in the summer. Underneath the front window, lies a row of white gaura (Gaura lindheimeri), which flowers in spring and fall. This perennial is hardy to zone 5. Agave are my favorite type of succulent and I have several different types in my garden. This one is near the front entry and is called artichoke agave (Agave parryi ‘truncata’). It is a medium-sized agave and can grow in zones 7 and up. As you can see, it has produced some offsets (babies, pups, volunteers). They are attached to the mother plant by a underground stem. This one was planted 2 years ago from the mother plant. It is easy to take offsets and plant them in other areas in the garden. I wrote about it a few years ago and you can read it here. In late winter, I am always impatient to see my globe mallow begin to show the first glimpse of color peeking through. I have several globe mallow plants and each one produces a different-colored flower. Here is my pink globe mallow. And it’s neighbor, which has white flowers. This globe mallow has vibrant, red flowers and is located on the other side of my front garden. The most common color of globe mallow is orange. But, as you can see, there are other colors available. I mentioned that I had a few different species of agave in my garden. This is my largest one, which is called octopus agave (Agave vilmoriniana). I raised this agave from a tiny pup (bulbil) from the flowering stem of its mother, who I had grown in a large pot. This agave has a tropical look with its curvy leaves and does best in areas with filtered or afternoon shade. Victoria agave (Agave victoria-reginae) was named for Queen Victoria. This smaller agave has a very distinctive look and is highly-desired, which makes it rather expensive. I was given the largest one in the photo, above, by a client and it has since gone on to produce many babies for me. Some people may think that lantana is overused in the landscape, but I like to put a twist on the traditional lantana. There is a lantana called ‘Lavender Lace’ that produces both purple and white flowers on the same plant. BUT, it can be hard to find and is expensive. So, I create the same look by planting both a purple and a white trailing lantana in the same hole. My favorite types of plants are flowering shrubs and groundcovers. However, I like the different textures that succulents add to my front garden. So, I have green desert spoon (Dasylirion acrotriche) on both sides in the front. This species of desert spoon has a darker-green color then the gray/blue leaves of regular desert spoon. Finally, I’d like to finish with my favorite flowering shrub, Valentine whose red blooms began to appear at Christmas and will last through April. I hope you enjoyed this partial tour of my front garden. I do have trees and other plants growing, but because they are dormant in winter, I will show you them in the future, once they are looking their best. **Tonight, I am leaving on the red-eye for Miami, Florida where I will be taking part in the Saturday6 once again. So what is the Saturday6 you might be asking? We are a group of 6 garden bloggers from around the country brought together by Troy-bilt to test their products, write garden articles and give our honest opinions and advice. While in Miami, we will be touring the Vizcaya Museum and Gardens. Later, we will be creating a community garden in Miami, filled with edible plants. I will be sure to share with you our adventures. I can hardly wait to leave!